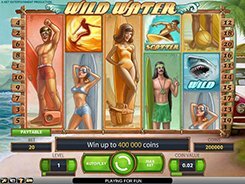 Wild Water is a surfing-themed video slot developed by NetEnt and played over 5 reels and 20 fixed lines. The slot features five big-size Surfer symbols that cover three positions on a reel which adds to the attraction of the slot. 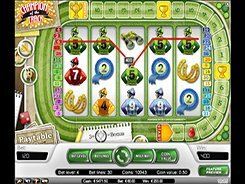 You can adjust the number of coins per line and a coin value, which translates into the minimum bet of $0.2 and the maximum bet of $100 per spin. The Surfer symbols can be displayed fully or partially depending on how the reels stop after spinning. Hitting any five Surfer symbols, each covering an entire reel, awards the Surf’s Up bonus payout of x20 times a total bet. Hitting all five different surfers on the reels awards the Surf Team bonus of x200 times your bet (or a massive $20,000 on the max bet). 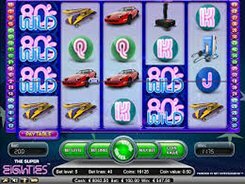 The slot has a wild symbol that substitutes for all regular symbols and turns into an expanding wild during a free spins feature which is triggered by three or more scatter symbols. 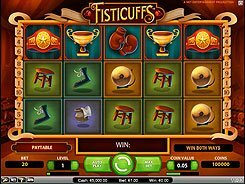 Besides, three, four or five scatters pay out x15, x30 or x60 times a total bet.